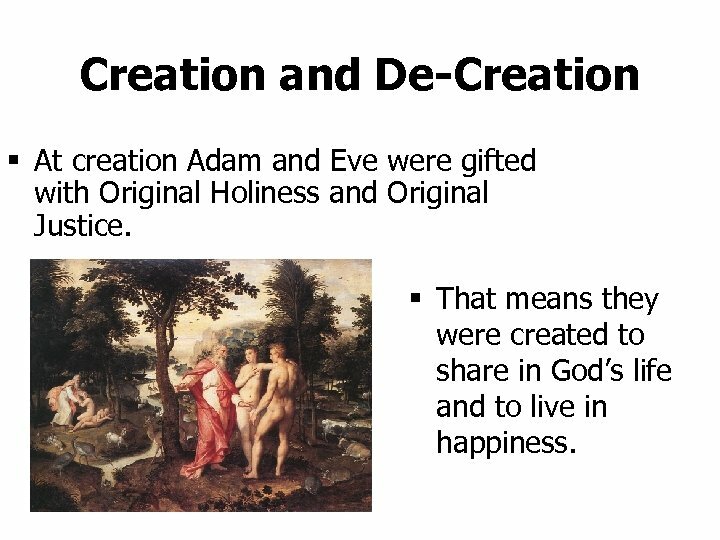 Creation and De-Creation § At creation Adam and Eve were gifted with Original Holiness and Original Justice. § That means they were created to share in God’s life and to live in happiness. 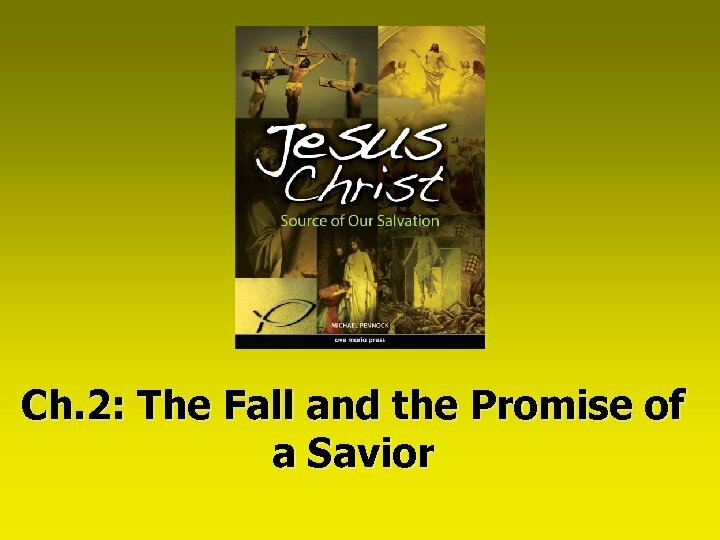 • However, temptation by Satan lead to the original sin, the first personal sin committed by human beings. 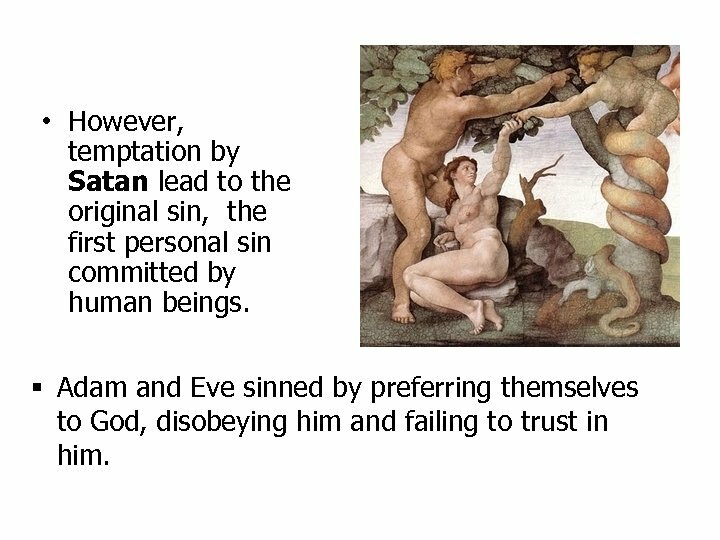 § Adam and Eve sinned by preferring themselves to God, disobeying him and failing to trust in him. Discussion: God created human beings to live with him in peace and happiness. Why do you think the first humans turned away from God? 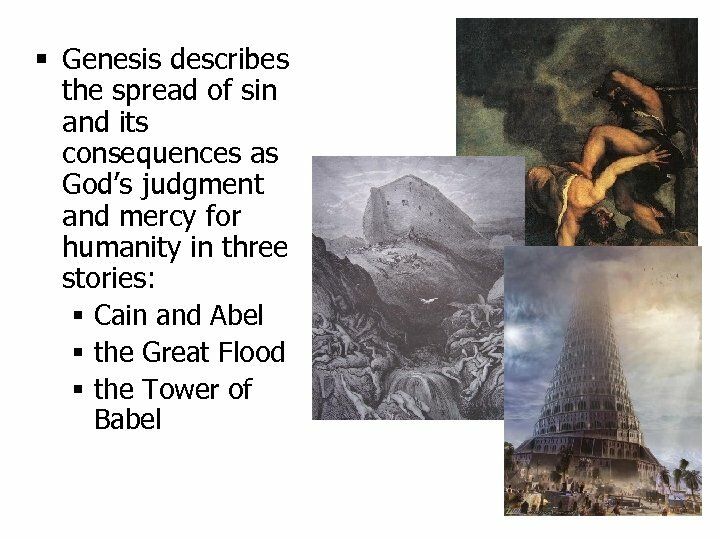 Was Original Sin a Historical Event? 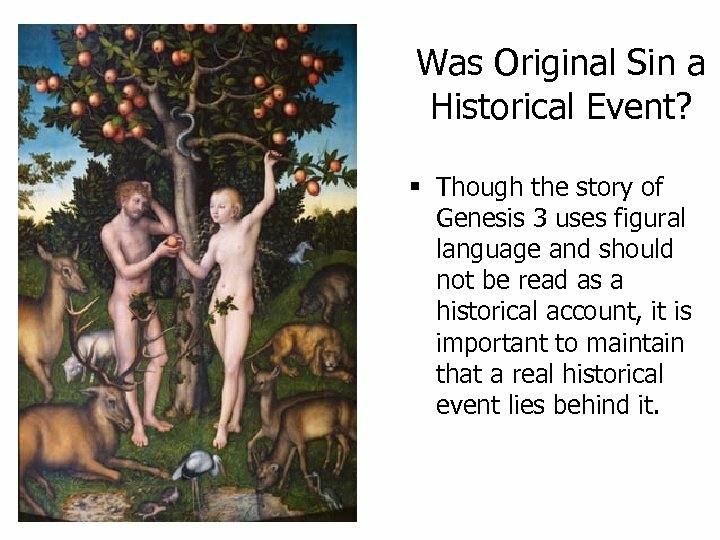 § Though the story of Genesis 3 uses figural language and should not be read as a historical account, it is important to maintain that a real historical event lies behind it. 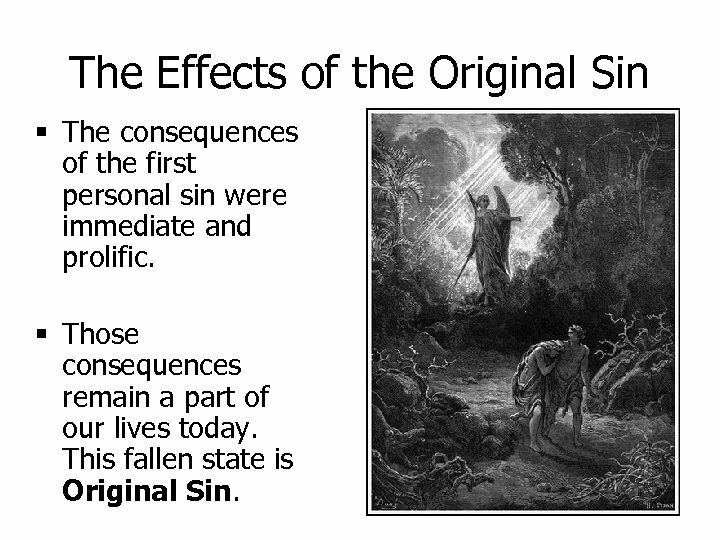 The Effects of the Original Sin § The consequences of the first personal sin were immediate and prolific. § Those consequences remain a part of our lives today. This fallen state is Original Sin. 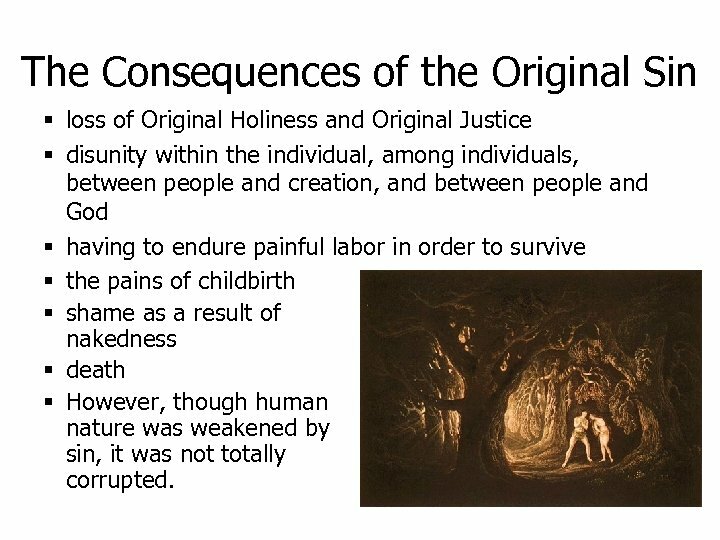 The Consequences of the Original Sin § loss of Original Holiness and Original Justice § disunity within the individual, among individuals, between people and creation, and between people and God § having to endure painful labor in order to survive § the pains of childbirth § shame as a result of nakedness § death § However, though human nature was weakened by sin, it was not totally corrupted. 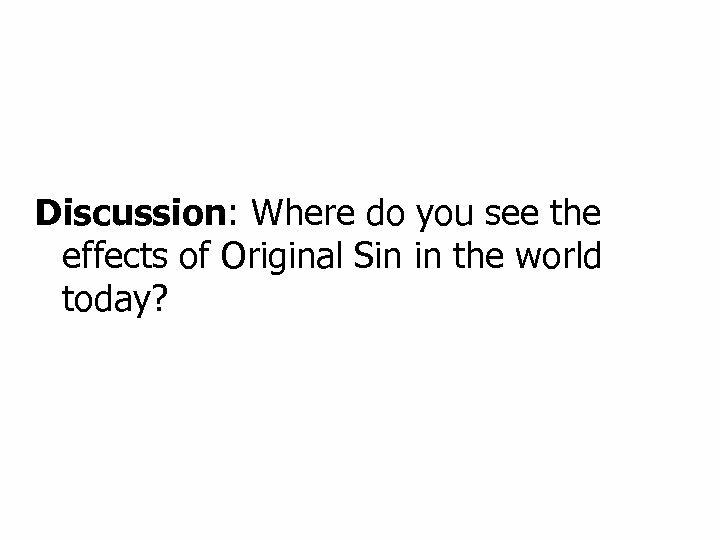 Discussion: Where do you see the effects of Original Sin in the world today? 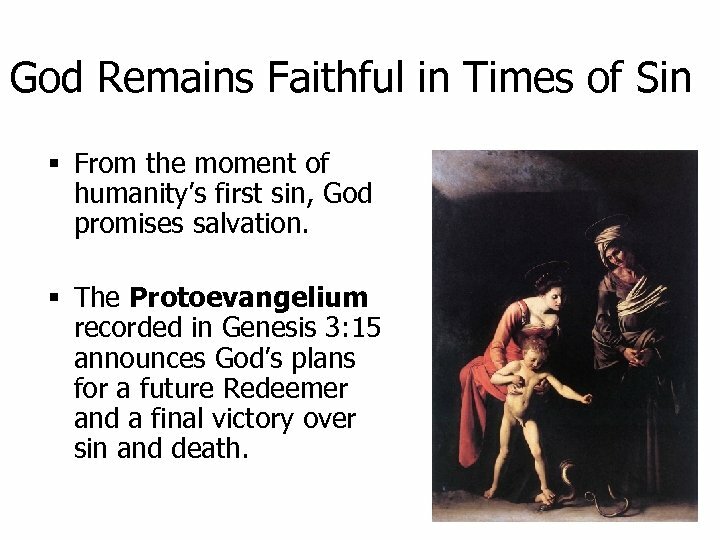 God Remains Faithful in Times of Sin § From the moment of humanity’s first sin, God promises salvation. 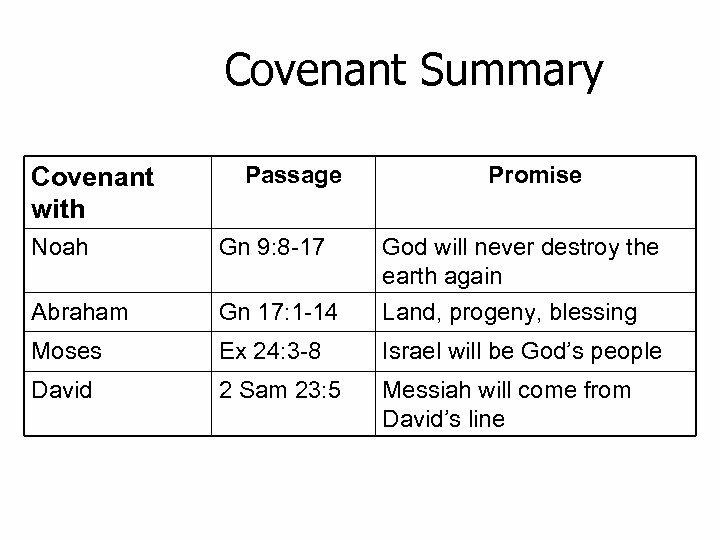 § The Protoevangelium recorded in Genesis 3: 15 announces God’s plans for a future Redeemer and a final victory over sin and death. 1. 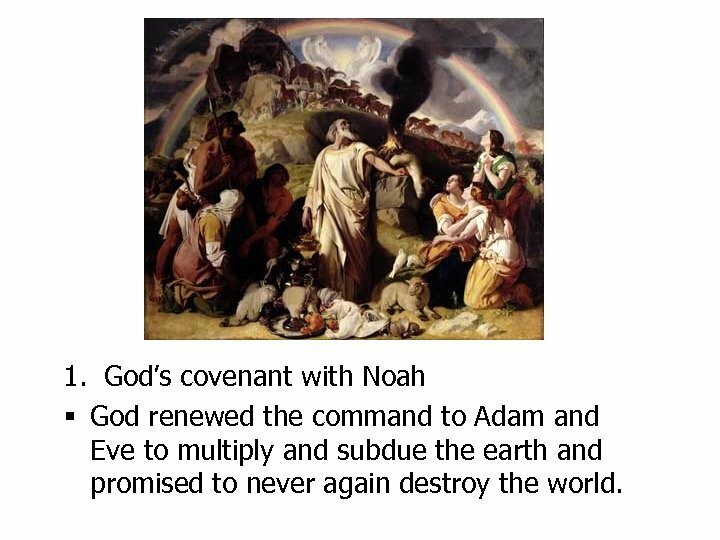 God’s covenant with Noah § God renewed the command to Adam and Eve to multiply and subdue the earth and promised to never again destroy the world. 2. 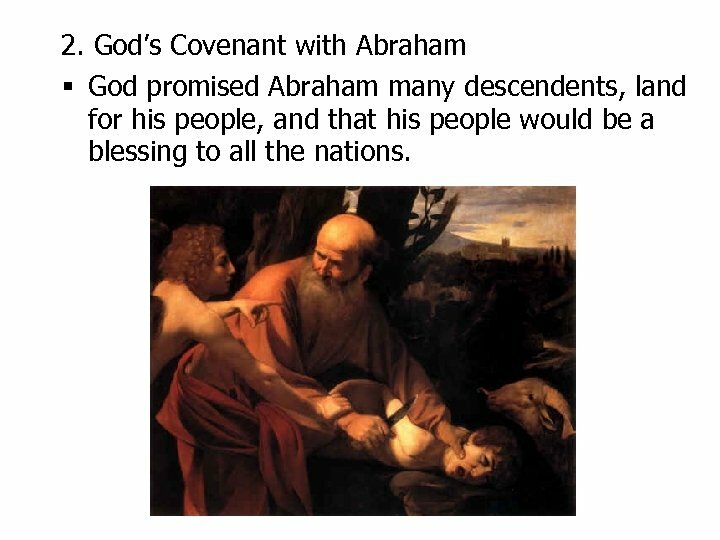 God’s Covenant with Abraham § God promised Abraham many descendents, land for his people, and that his people would be a blessing to all the nations. 3. 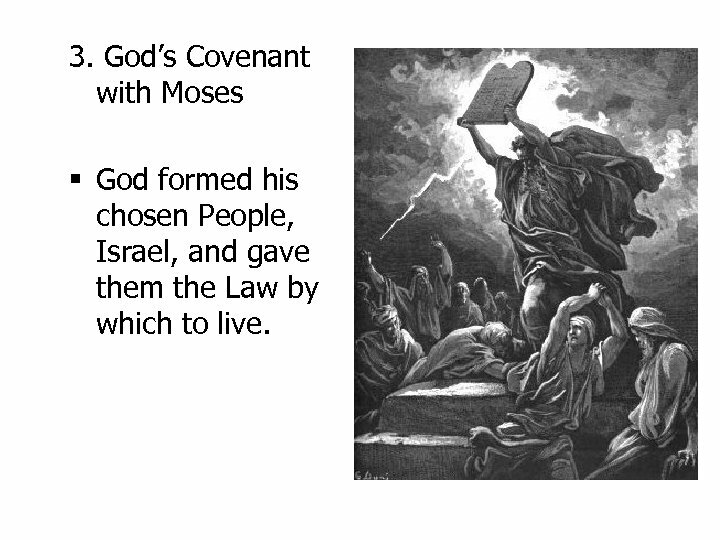 God’s Covenant with Moses § God formed his chosen People, Israel, and gave them the Law by which to live. 4. 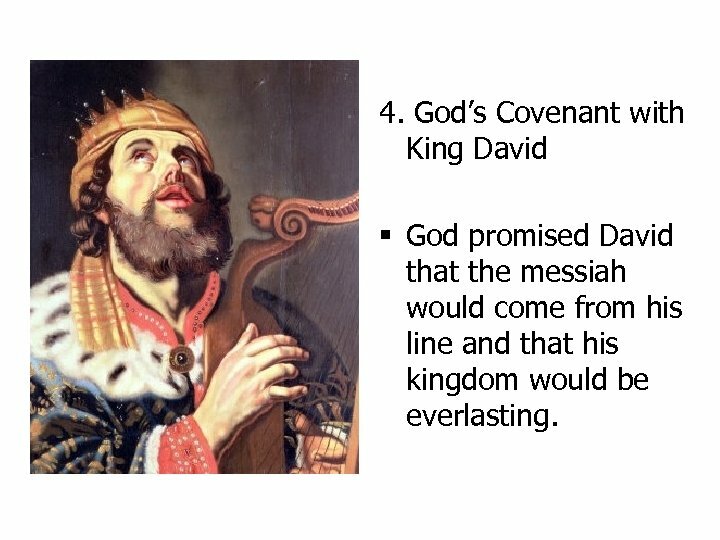 God’s Covenant with King David § God promised David that the messiah would come from his line and that his kingdom would be everlasting. 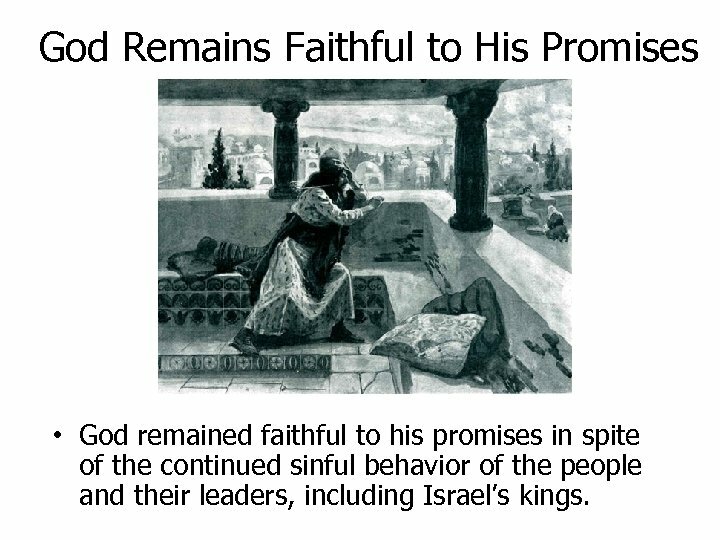 God Remains Faithful to His Promises • God remained faithful to his promises in spite of the continued sinful behavior of the people and their leaders, including Israel’s kings. 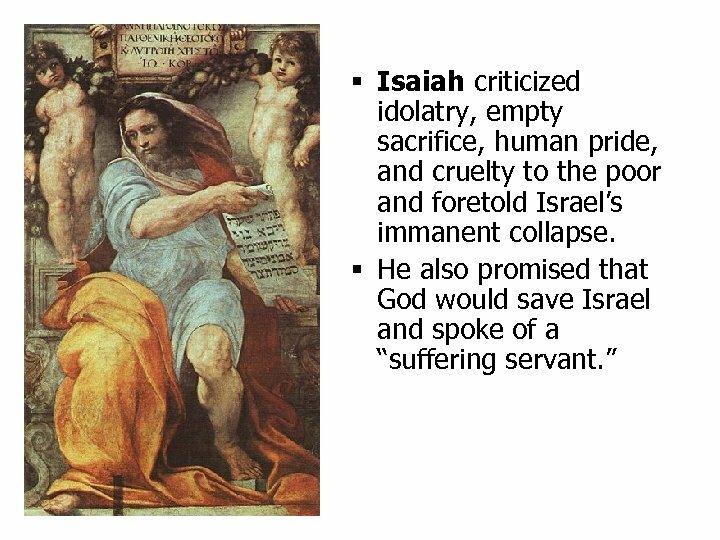 § God’s fidelity was exemplified in the message of repentance and hope preached by his prophets. 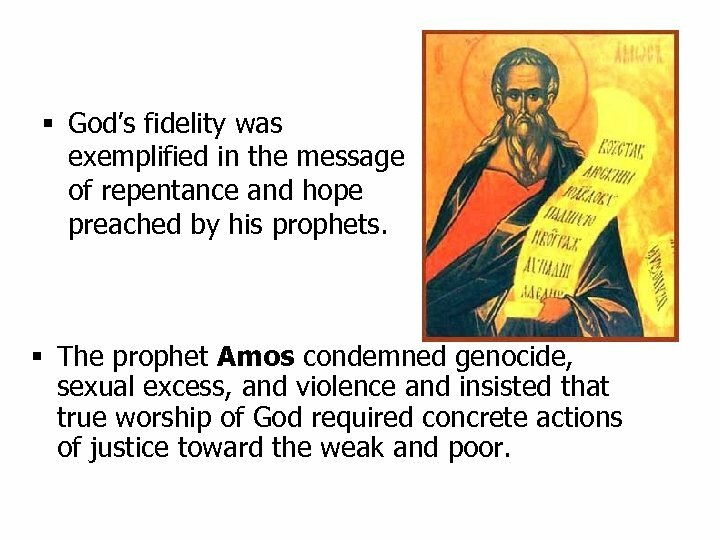 § The prophet Amos condemned genocide, sexual excess, and violence and insisted that true worship of God required concrete actions of justice toward the weak and poor. 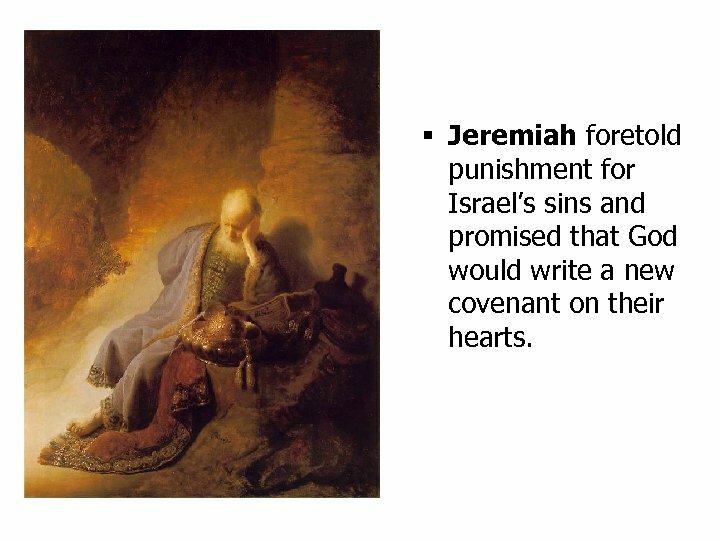 § Jeremiah foretold punishment for Israel’s sins and promised that God would write a new covenant on their hearts. 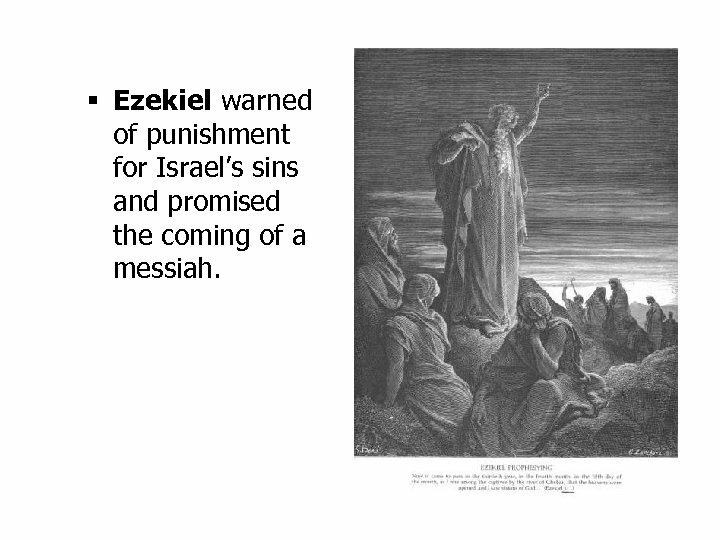 § Ezekiel warned of punishment for Israel’s sins and promised the coming of a messiah. 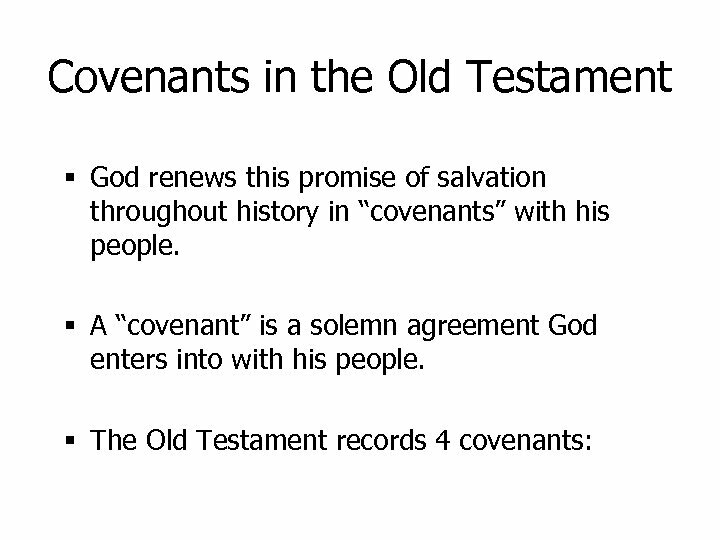 § In Christ all the prophecies and covenants find their fulfillment. 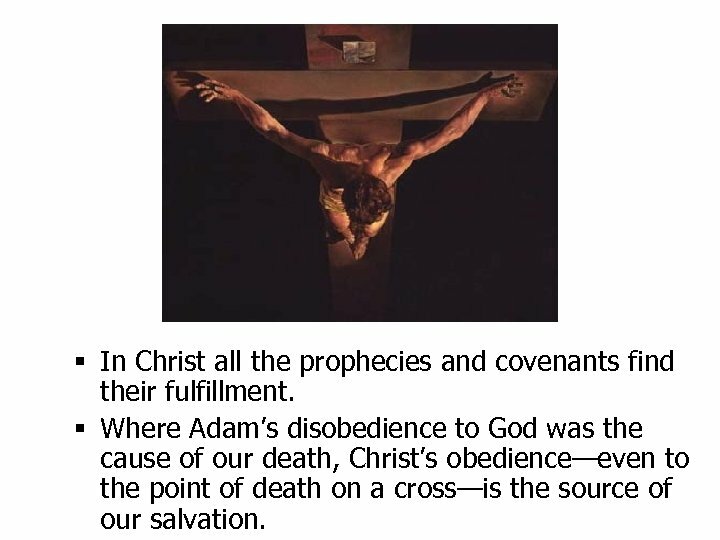 § Where Adam’s disobedience to God was the cause of our death, Christ’s obedience—even to the point of death on a cross—is the source of our salvation.